Tuscany is a truly ‘must visit’ destination. For this tour, we've chosen the best highlights of this mesmerizingly beautiful corner of Italy; tick off your bucket list the vibrant city of Siena, majestic art in Florence, ancient Lucca and of course the Leaning Tower of Pisa! This elegant spa town provides our base for the week. It is linked by funicular rail to Montecatini Alto with splendid views over the Tuscan landscape. Both are charming and surrounded by gently rounded hills quilted with woods, olive trees and vineyards. Perhaps sample a glass or 2 of Chianti over one of our included dinners in a charming local restaurant? A full day in Florence, picturesquely situated on both sides of the River Arno, will give us time to explore the cultural sites and soak up the atmosphere of ‘la Bella’ (the beautiful), so-called by the Italians. Stroll across the Ponte Vecchio, wander through the Piazza della Signoria and marvel at the astonishing abundance of art treasures and magnificent statues this ‘city of art’ is famously known for. A full day of sightseeing takes us to the city of Siena with its maze of steep and narrow streets. Nestling in the Tuscan Hills, this vibrant university city is also one of the greatest art centres of Italy with a profusion of fine architecture. 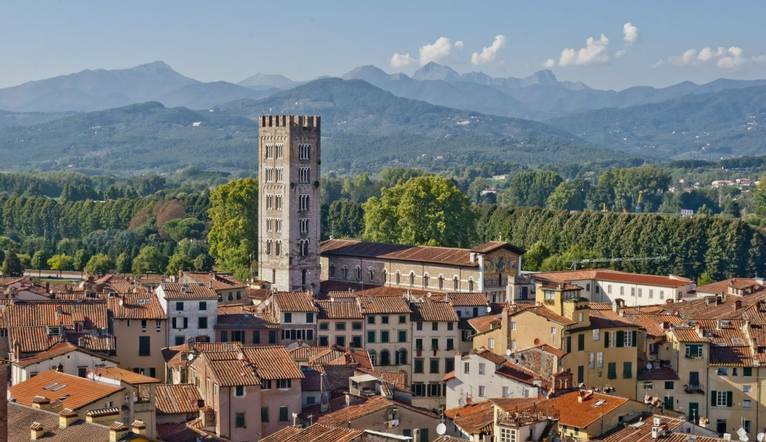 We also include a day trip to Lucca and Pisa. Lucca is a colourful and ancient city rich in cultural heritage, with an urban centre completely enclosed by fortifying walls. This fascinating city has many churches, monuments and gardens to explore. We then move on to Pisa to explore the mystery of the famous Leaning Tower. Treasures of Tuscany gives you a real taste of the region and plenty of time on your own to explore. Everything was well arranged and thought through. We had a very efficient and friendly Tour Leader for whom nothing was too much trouble. A good selection of places to visit with enough free time to explore and also free time in between visits for doing your own thing. The hotel is set in the heart of the thermal town of Montecatini, only a stone’s throw from the famous spas, which can be reached by a pleasant stroll through the park. Facilities at this hotel include a restaurant and bar. An indoor pool can be enjoyed by hotel guests (not open in winter months). The rooms have a safe, hairdryer, satellite TV, air-conditioning, telephone and minibar. The transfer time from Pisa Airport to your hotel is approximately 1 hour. We include 3 full days of sightseeing: Florence with a guided tour included; Lucca with a guided tour included, an excursion to Pisa and a trip to Siena with a guided tour included. Please note there is a local hotel tax of approximately €9.80 per week payable on departure from the hotel. From our hotel we may take the funicular up to Montecatini Alto. Approx cost € 7.00 return Perhaps enjoy a wine tasting lunch at a local vineyard. Approx cost €25 including taxi. Your Tour Leader will help arrange this for you but may not necessarily accompany you. Casual daytime light-weight “layers” are recommended. Comfortable shoes are a “must” for sightseeing. Smart, casual wear for the evenings. Dressing in layers to allow for changes in temperature is recommended. This tour includes visits to some of Italy's most popular sites, where there is an added risk of pickpockets - so caution is advised as far as money and jewellery. Your local guides will advise on care in the most crowded sites.